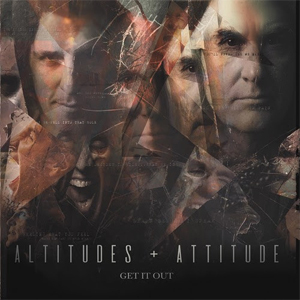 ALTITUDES & ATTITUDE, featuring ANTHRAX bassist Frank Bello and MEGADETH bassist David Ellefson, will release it's debut album, Get It Out, on January 18, 2019 via Megaforce. The follow-up to ALTITUDES & ATTITUDE's 2014 self-titled EP was once again produced by Jay Ruston (ANTHRAX, STEEL PANTHER, STONE SOUR), with Jeff Friedl (A PERFECT CIRCLE, ASHES DIVIDE) returning behind the kit. The official lyric video for the first single, "Out Here", made by Melody Myers of Designed By Melody, can be viewed below. A kind of rock 'n' roll primal-scream therapy, Get It Out is the result of nearly four years of writing and recording sessions — and decades of touring, searching, striving and living. "I've learned that writing songs is very cathartic," says Bello, who has long made songwriting a daily practice. When ANTHRAX is off the road, he tries out new material at open mics around New York City. "A lot of these lyrics are about the inner struggles of my life, and about the rage that has built up from my life experiences — my brother's murder; my father abandoning my family when we were young, leaving us with no funds to pay the bills," he says. "The ups and downs of life in general. I've always had an anger inside that music really helps me deal with." Bello and Ellefson debuted ALTITUDES & ATTITUDE in early 2014, with a self-titled three-song EP that earned the duo airplay on SiriusXM and an appearance on VH1 Classic's That Metal Show. Those tracks — "Booze and Cigarettes", "Tell the World", "Here Again" — are included on Get It Out as bonus cuts, in remixed and remastered form.